I've found myself this week furiously googling all manner of things, from how to settle a baby into a routine, to how to make your own roller blind. And you know where the most informative, unbiased advice can be found? The blogging community! So hurrah for all you bloggers who are so keen to share your knowledge, creativity and ideas! 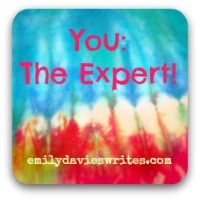 And that's why You: The Expert exists, to gather together all your tips, tutorials and advice. From recipes, to DIY crafts to parental advice - I want to know about it! So, link up your tutorials, old and new, here before Friday at 5pm. The only rules arre that you spread the word (e.g. via Twitter) and that you comment on someone else's link. I pin everyone's links so to see what people have linked in the past, click here.